Take a literary journey across America with influential writer and psychogeographer, Iain Sinclair. The acclaimed author of Ghost Milk, Hackney, that Rose-Red Empire, London Orbital and Lights Out for the Territory, Iain turns his focus on the compelling, memory-filled landscapes of the American Beats and their fellow travellers in his forthcoming book American Smoke. Chronicling his epic walk in the footsteps of Kerouac, Burroughs, Snyder, Olson and Lowry, it is enlivened by false memories, broken reports, obsessions with the Old West and strange adventures. 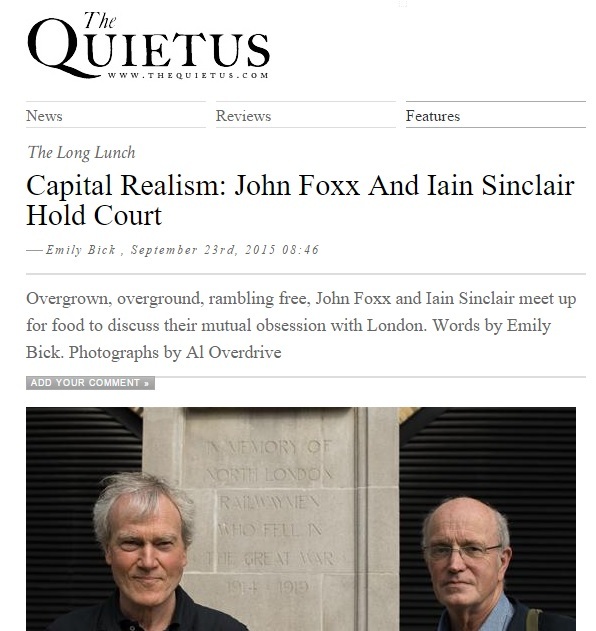 The Scottish Poetry Library website has uploaded a forty-minute podcast with Iain Sinclair. Click here to listen to it. Writers’ Centre Norwich has uploaded a conversation between Iain Sinclair and acclaimed graphic novelist Alan Moore at Words & Ideas for the Norfolk & Norwich Festival. Click here to listen to Alan Moore and Iain Sinclair Discuss Writing and Protest for Words & Ideas on Souncloud. Iain Sinclair has written numerous works on Hackney and the East End including Hackney: That Rose Red Empire. In this talk he will look at some of the consequences of imposing grand-project parks and computer-generated palaces of vanities on East London. He outlines a few absurdist strategies for countering such ruinously expensive activity from the attractive but untenable position: that there is nothing wrong with any extravagant plan or proposition, so long as it is not actually constructed. Seats must be booked in advance. For Iain Sinclair’s talk at The Round Chapel 500 places can be offered; for this talk only HHBT are asking for a minimum donation of £2 per head to cover expenses. All bookings can be made with Lisa Pressland, Venue Manager for Hackney Historic Buildings Trust. Please email info@hhbt.org.uk or call 02089860029 to reserve a place. Doors open at 7pm for a 7.30pm start, with the exception of Kate Colquhoun’s talk on Thursday 23rd May, for which doors open at 7.30pm for an 8pm start. More information – especially upon the other talks of the ALW – can be found here. EVENING TALK: Join leading contemporary artist Gavin Turk as he talks with the writer and filmmaker Iain Sinclair about his career. Turk has created pioneering sculptures, installations and images that explore authorship, authenticity, and art history. This event is chaired by TimeOut critic Ossian Ward and coincides with the publication of a major new monograph on the artist.